Haiti experienced about two weeks of instability during the month of February 2019. By Monday February 25, I can say life has begun to come back. We praise the Lord for answering our prayers. Thanks to our partners and friends in the USA and other Countries who have prayed a lot for Haiti. Please continue to pray. The costing of living was high before the events. After about two weeks of an unstable situation, the cost of living has become higher. The President of Haiti is calling to dialogue between Haitians. He has even created a committee to work on the dialogue process. We hope and pray that works, because discussion together with mutual respect is a step in the right direction. Let us pray for wisdom and stability. The cost of living seriously effects our ministries. We have more needs but much less resources. We appreciate the financial support we receive regularly, but what we receive now is much less than what we used to receive the years before. We will be obliged to stop temporarily the feeding program if we do not receive more financial support in the coming months. We really count on your prayers. We are happy you are interested in Haiti. The mission of Partners with Haiti includes these elements. A channel of support for Haitian and other Christian workers and projects such as feeding programs, medical aid, employment, building/construction projects, caretaking, supply of needed materials, vehicles and transportation services. Establishing relationships with sister churches in Haiti and other third world countries for the U.S. and Canadian-based churches. Assisting in the growth and development of churches in such areas as evangelism, Christian education, pastoral counseling and strengthening family life. Coordinating and sponsoring U.S. and third-world speakers who will present the work for education, prayer, personnel, and funding. Individual and group child sponsorships for education, including Christian-based education, meals, food, uniforms, and other basic needs. Funds for natural disasters and other crises. Encouraging and supporting the development of leadership for long-term management of any or all of the foregoing at the national level in Haiti and other third world countries. Dr. Claude Noel, the founder of Partners with Haiti, went to be with the Lord on September 26, 2018. His good works and legacy will live on through the programs he established and the lives of the many people he and his ministries have touched. Claude Noel's ministry of nearly 70 years reached countless people around the world for Christ. Check all of our pages for updates and information! Partners with Haiti was incorporated in 1981. Twenty churches and 500 individuals throughout the United States and abroad contribute to this ministry. Included are programs that provide spiritual support, education, medical care and job promotion in Haiti. PWH Ministry opportunities continue to expand. Please join with us in assisting the Evangelical Churches of Haiti to impact their culture with the Gospel of Jesus Christ. The ministry of PWH has spanned over a half century. You will find the Haitian Christian family to be gracious and appreciative of our fellowship. 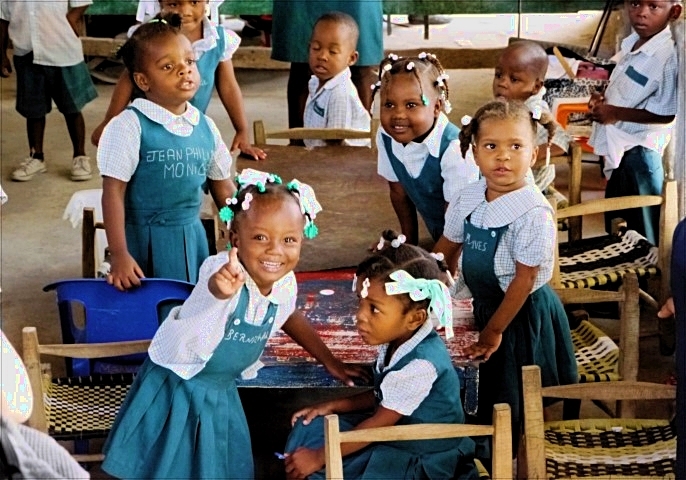 Your tax-deductible donations will directly help build lives and educate Haitian children in the name of Christ. BONJOU! Mesi anpil pou vizite website Partners with Haiti (PWH). Nou kontan wap enterese nan Ayiti. PWH se yon òganizasyon Kretyen ki gen yon pwogram sipò pou timoun, èd pou lekòl, legliz, pastè ak klinik medikal nan Ayiti. Nou te travay Ayiti depi lontan. PWH te fèt nan lane 1981 nan Barrington, Rhode Island. Doktè Jean Claude Noel kofondateur ak bon zanmil Dr. David Madeira te travay lajounen kou lannwit pou moun Ayiti! Kounyeya travay yo kontinye nan yon nouvo jenerasyon. Nou ankouraje ou pou w' tounen isit la pou nouvèl sou travay nou an Ayiti. "Men anpil, chay pa lou"
Welcome! Thank you very much for visiting the website of Partners with Haiti. We are happy you are interested in Haiti. PWH is a Christian organization that has a child sponsorship program, and help for schools, churches, pastors and medical clinics in Haiti. We have been working in Haiti for a long time. PWH was founded in the year 1981, in Barrington, RI, USA. Dr. Jean Claude Noel and cofounder, good friend Dr. David Madeira, worked day and night for the people of Haiti! Now their mission continues in the hands of a new generation. We encourage you to return here for news about our work in Haiti. "Many hands lighten the load."